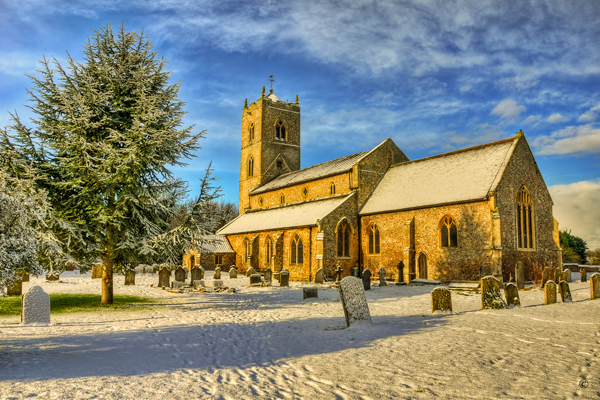 Gayton Church is dedicated to St Nicholas who is much in our minds at Christmas time. 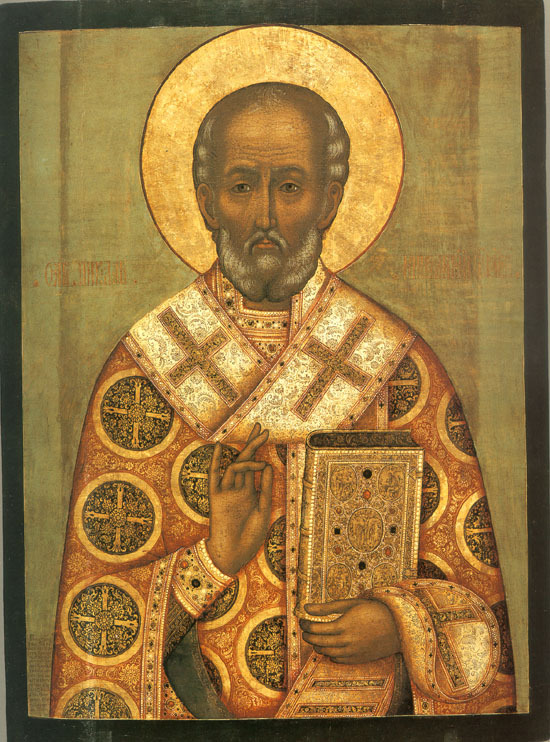 Nicholas was a Bishop who lived in the fourth century AD in a place called Myra in Asia Minor (now called Turkey). He was a very rich man because his parents died when he was young and left him a lot of money. He was also a very kind man and had a reputation for helping the poor and giving secret gifts to people who needed it. There are many stories of his kindness and one concerns a poor man who had three daughters. He was so poor, he did not have enough money for a dowry, so his daughters couldn't get married. One night, Nicholas secretly dropped a bag of gold down the chimney and into the house (This meant that the oldest daughter was then able to be married.). The bag fell into a stocking that had been hung by the fire to dry! This was repeated later with the second daughter. Finally, determined to discover the person who had given him the money, the father secretly hid by the fire every evening until he caught Nicholas dropping in a bag of gold. Nicholas begged the man to not tell anyone what he had done, because he did not want to bring attention to himself. But soon the news got out and when anyone received a secret gift, it was thought that maybe it was from Nicholas. His kindness was such that he became a Saint and the patron Saint of children ( and also sailors from another story). By the sixteenth century, the story started to change and in England, he became 'Father Christmas', a character from old children's stories. In France, he was then known as 'Père Nöel'; in Germany, the 'Christ Kind'. In the early USA this name changed into 'Kris Kringle'. Later, Dutch settlers in the USA took the old stories of St. Nicholas with them and Kris Kringle became 'Sinterklaas' or as we now say 'Santa Claus'. 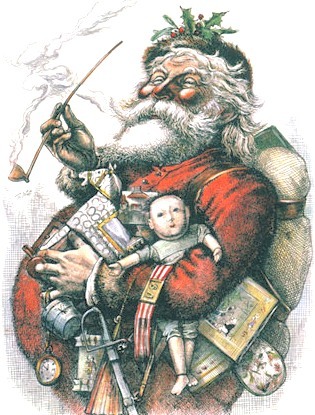 The Victorians took the story of Father Christmas to their hearts and Charles Dickens popularised what we now consider the traditional Christmas. Saint Nicholas wore the red robes of a bishop but it was a magazine illustration in Harper's Weekly in 1881 that first showed Father Christmas as a jolly chap with white beard and red and white jacket clutching an arm full of toys. This is how we generally think of St Nicholas today, but what has not changed is the knowledge that Christmas is a time for kindness and generosity. A time for children and to remember that it all starts with the birth of Jesus. 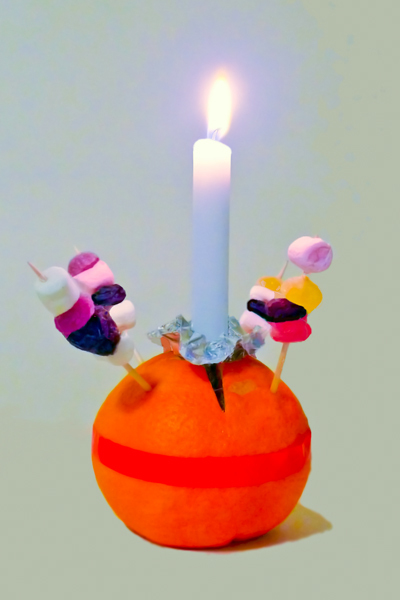 Christingle means ‘Christ’s Light’ and it is a symbol of the Christian faith. Lots of churches hold Christingle services around Christmas time. The custom of giving out lighted candles in these services began in Germany in 1747 but it wasn't introduced to the Anglican Church in England until 1968. 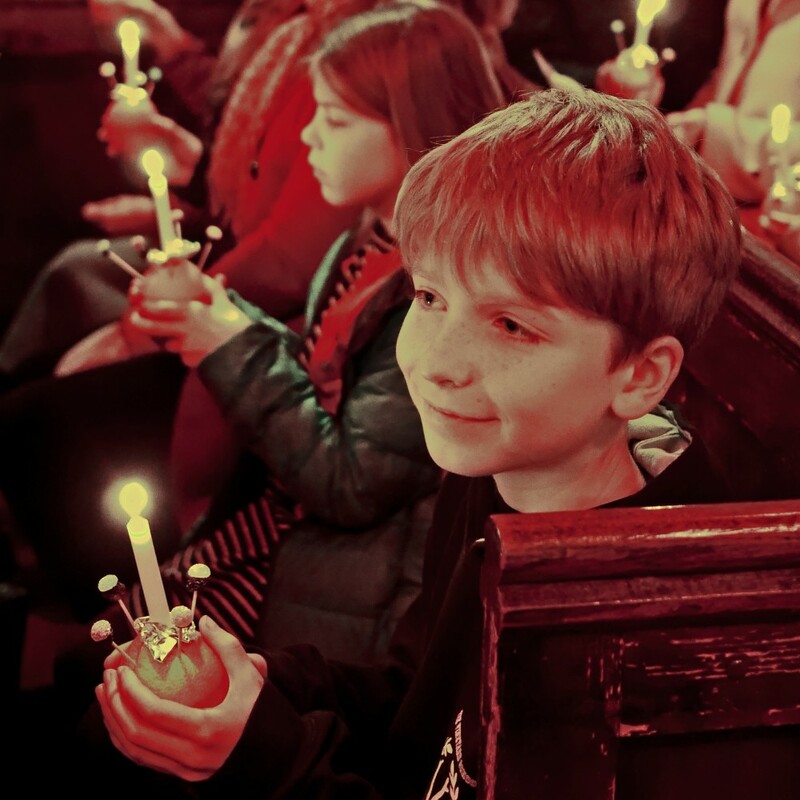 The highlight of all Christingle celebrations is the lighting of the Christingle candles under dimmed lights - a moment filled with awe and wonder for children and adults alike. Christingles are made up of different parts, each one being there to remind us of something. The red ribbon goes around the 'world' and is the colour of blood, reminding Us that Jesus died for Us. The four cocktail sticks could mean the four seasons or the four corners of the world. The sweets remind Christians of God's gifts to the world including kindness and love. of the country’s most disadvantaged children. You can see this work in action on a special web page at www.christingle.org. 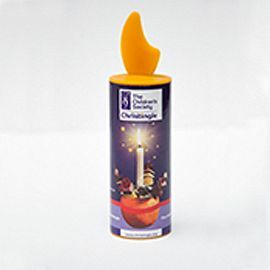 Remember to bring your Christingle Collection Candle Tube if you have one.